"Save Yourself from Reminding or Texting Mom or Dad Everyday"
125, 000 deaths each year due to medication non adherence. Medication nonadherence can be a major problem for any age group, especially to your parents who are prescribed multiple medications due to health conditions. The health consequences are extremely harmful or even deadly. In an effort to improve medication adherence you, as their son or daughter will organize medications using simple pillboxes and contacting them daily via phone to make sure they’re taking their medications on time. This daily task can be overwhelming for both yourself and for your parent. This task can overtake your life. From the perspective of your parent, it may seem that you do not trust or feel they are competent to manage their own medications. As a solution there are several companies offering many different types of reminder devices such as watches, pillboxes with timers and automatic pill dispensers. One unique item e-pill, LLC is offering what is called the CADEX 12-Alarm Medication & Medical ID watch. The e-pill CADEX 12-Alarm Medication & Medical ID watch not only reminds the user up to 12 daily times, but it will also show a text message for each alarms (up to 36 characters per alarm). Insurance company & policy number. The e-pill CADEX watch medical ID databank stores critical health information similar to the medical ID bracelets. Simply press the ALERT button and all your medical information will be shown. 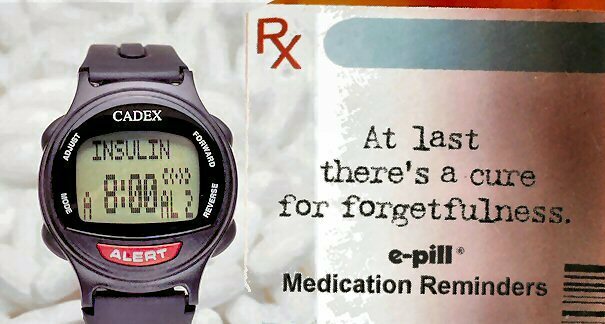 Have “piece of mind” with the e-pill CADEX 12-Alarm Medication and Medical ID Watch.